The growing volume of electronic waste, including discarded products with a battery or plug, such as mobile phones, laptops, televisions, refrigerators and electrical toys, poses a major threat to the environment and human health, the United Nations warned on yesterday. 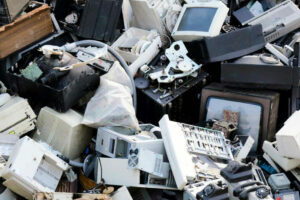 “Environmental protection is one of the three pillars of sustainable development […] E-waste management is an urgent issue in today’s digitally dependent world, where use of electronic devices is ever increasing,” said Houlin Zhao, Secretary-General of the International Telecommunication Union (ITU). Hey Buddy!, I found this information for you: "Electronic waste poses ‘growing risk’ to environment, human health, UN report warns". Here is the website link: https://www.duurzaam-ondernemen.nl/electronic-waste-poses-growing-risk-to-environment-human-health-un-report-warns/. Thank you.